The HM-26/27 models were in production for a very long time, with some minor modifications over time. 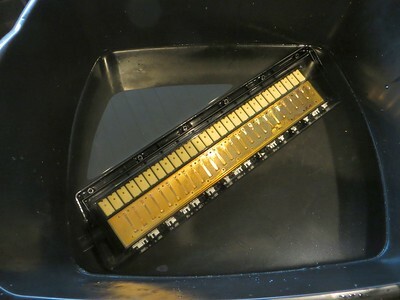 These have a distinctive sound, but their main distinction is that the sound comes mainly out the holes in the bottom rather than up through the keyboard, a feature that has been exploited recently to great effect by Lowboy Bootay, as illustrated and explained by Lowboy at melodicaworld.com. Additional third series models include the HM-32 and Cassotto 26/27 models. Made in the Czech Republic? 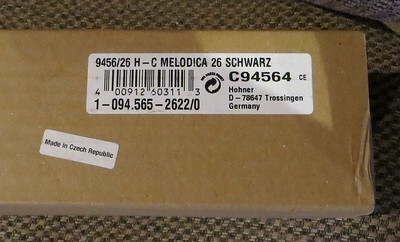 If the box this one came in is a reliable indicator, some of these were manufactured in the Czech Republic, which came into existence in 1990, rather than actually in Trossingen, Germany. 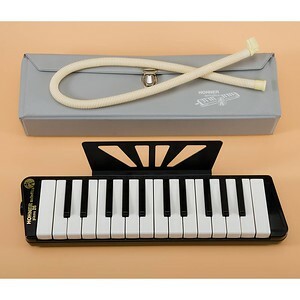 In any case, this Melodica was sold as new from remaining stock after 2011. The design of the Piano models on this series is rather unique. 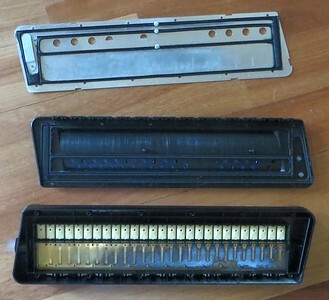 While most of the sound of melodicas typically comes up through the keyboard, in these models it is emitted through the holes in the bottom. Visible through holes in this photo is blue painter's tape that has been used to9 cover most of the holes so that the sound can be modulated with fingers or palm applied to the remaining holes. This feature of these models has been most fully exploited by way of innovated techniques created by Lowboy Bootay. 2nd down, the original or "first" series of Piano 26/27. 3rd down, the "second" series, to which the Piano 20 (bottom) is most closely related. Top, the "third" series. Roughly, 1960s, 1970s, and 1980s (to 2011) models. 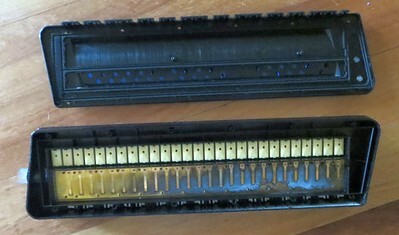 Original button style Hohners HM-900 and 901 shown to the right. Production and sale of these two models continued well into or through the 1970s. 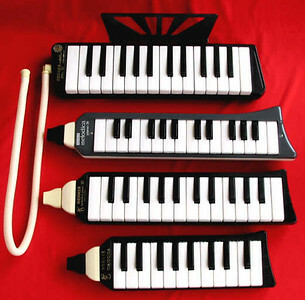 All of these shown models (other than the Piano 36) + the Piano 20 share a distinctive type of sound in comparison with other melodicas, including other Hohners, though they also vary in their uniques sound from model to model. At the top here is shown the metal plate that covers then reed chamber in a Cassotto 26. The Cassotto's sound chamber mounts below the other side of the plate. 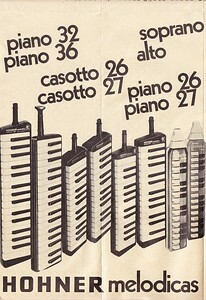 At bottom , the regular Piano 26, on whose base a Cassotto plate and box can be mounted. Piano 26 receiving a bath in 1-3 mixture of distilled Vinegar and water. It first soaks for an hour or two, with some working of the keys to loosen up any dirt or debris and then is thoroughly rinsed and allowed to dry for several hours before reassembly.